> Dried Chilies>Chipotle>Dried Chipotle Morita 1 Lb. 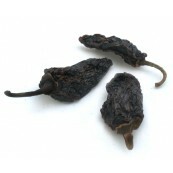 Dried Chipotle Morita 1 Lb. Chipotle Morita is dark reddish purple. This is the variety most often found in the United States. While it is quite flavorful it is not smoked as long as the ahumado and therefore not of the same high quality and cheaper to produce. Morita chilies are smoked, red-ripe jalapeno peppers, much like the chipotle pepper. The main difference is that Moritas are smoked for less time, which leaves them softer and retains their slightly fruity flavor. They are very richly flavored. The intense smoky, complex, rich flavor of the chili is used to enhance the taste of many dishes especially in the Mexican cuisine. It used to spice salsas, marinades, soups, stews, lentils and beans. Stem and seed the chilies, then place them in a skillet, on a comal, or in a 250 degree oven and dry-roast them for three to four minutes. Shake them once or twice and be careful not to scorch them or else they will taste bitter. The chilies should then be added to water that has been heated to just below the boiling point - if it is boiling, the chilies will lose flavor. Use just enough water to cover the chilies and press them down with a lid. Allow them to sit for 20 minutes or until they are soft. 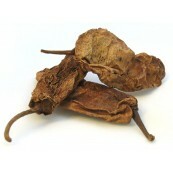 Store dried chilies (and chile powder) in an airtight container in a cool, dry, dark place. Although it is possible to store them for extended periods of time, it is better to use them within six months. If you do keep them longer, check through them occasionally and discard any that have spoiled.